Fancy slipping into something comfortable – and smart? Try this Snickers Workwear Bundle we’ve put together specially for professional painters and decorators like you. It includes trousers (with painter’s holster pockets), an ergonomic belt and tough kneepads. With Snickers Workwear, you’re getting style, comfort and practicality in one. Click 'Redeem' and the Dulux Trade Points Helpdesk will contact you within 2 working days to discuss sizes. Your Snickers Workwear Bundle will be delivered by post to the address you have registered with Dulux Trade Points. Please allow 10 working days for delivery. 1. 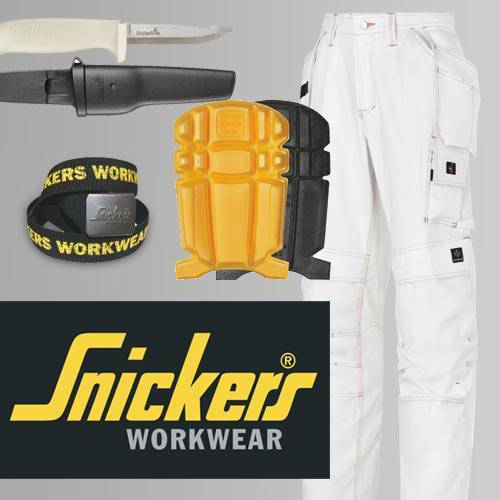 Offer is valid for a pair of Snickers Workwear trousers, ergonomic belt, and kneepads. 4. The promotion is not open to employees of Snickers Workwear, TLC Marketing or Dulux.